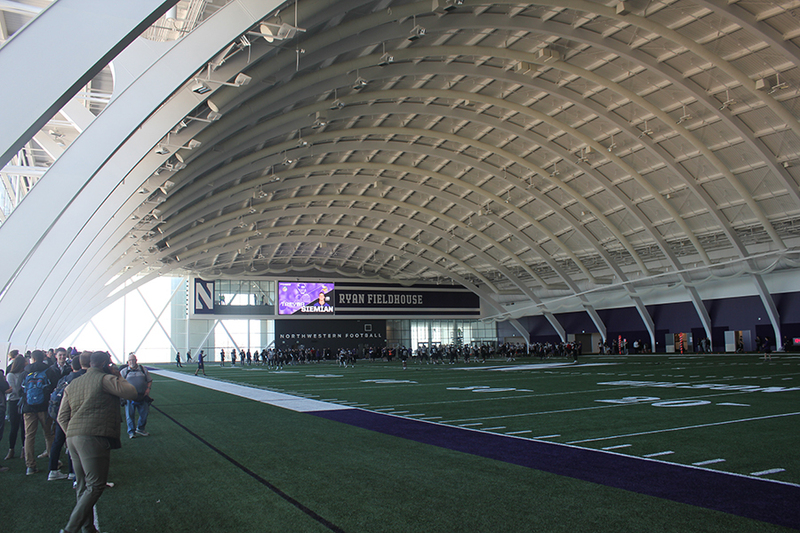 The Northwestern football team practices in the new Ryan Fieldhouse for the first time on Saturday. The 460,000-square foot facility will serve numerous purposes for Northwestern athletics and beyond. There are still a few kinks to work out in Ryan Fieldhouse: After the Wildcats had wrapped up their first football practice in the building, a fire alarm began blaring through the building. An alternating siren and evacuation message bellowed through the cavernous facility for more than 15 minutes, interrupting interviews and confounding officials about how to turn it off. Nonetheless, Saturday was a celebratory day for Northwestern, which officially christened the first component of the $265 million lakefront Walter Athletics Center, designed to become an on-campus hub for athletics and recreation. Only the indoor football practice facility, known as Ryan Fieldhouse — approximately one-fifth of the roughly 460,000-square foot complex — was unveiled. The remainder will open in the summer. The fieldhouse, which juts out over the beach and has floor-to-ceiling windows with views of Lake Michigan on two sides, contains nearly two fields worth of space, football coach Pat Fitzgerald said, and allows NU to practice punts, place kicks and kickoffs. That is in sharp contrast to Trienens Hall, the program’s relatively small indoor space that does not allow for some activities, like kicking. The Cats will also relocate many of their sports medicine, strength and conditioning, and administrative affairs to the new facility from a complex of buildings near Ryan Field. NU will not only have more compact operations, but an on-campus setup that will keep the Cats from being physically “ostracized” from other students, senior offensive lineman Tommy Doles told The Daily in 2016. Though football is the centerpiece, the fieldhouse and full complex are designed to incorporate NU’s other 18 varsity teams, recreational activities and large campus events. The field space can host varsity soccer and lacrosse games and will also be used for intramurals, Phillips said. It is slated to entertain School of Communication luminaries at “CommFest” performances later this month. Phillips listed new student convocation and large speaking engagements as additional uses for the facility; moving Dance Marathon to the building has also been discussed. The splashy, costly facility — the original $260 million price tag was the highest ever for a Big Ten football complex — will “raise the bar” for expectations across sports and usher in a new area of NU athletics, Phillips said. Fitzgerald bristled at that suggestion, launching into a passionate three-minute monologue about how his team must improve, regardless of its facilities. Still, Fitzgerald, who played for the Cats in the mid-1990s and returned to Evanston as a coach in 2001, said he realized the significance of the building on the program when he first saw the turf laid and the lights switched on.